I must confess that until about two weeks ago I had never heard of the Taiping Peace Initiative. I was therefore surprised to be invited to their 10th Aniversary on 20 January 2010. 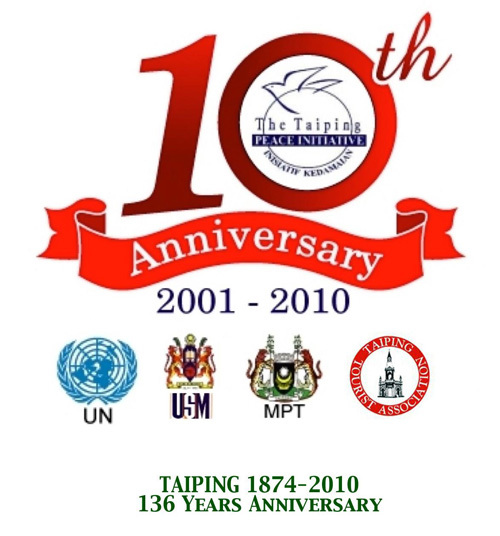 I discovered when I attended that the citizens of Taiping, through the United Nations Development programme (UNDP), Universiti Sains Malaysia (USM), Taiping Municipal Council and Taiping Tourist Association, decided that Taiping should contribute to peace and harmony in the country and the world by launching The Taiping Peace Initiative back in 2001. So they set up the Taiping Peace Initiative, an innovative partnership between civil society, local government and the private sector to promote, through practical action, a holistic concept of a “triple” peace- inner peace, social peace and earth peace. To this end, part of the Lake Garden, approximately 1.6 acres was transformed into a Peace Park with a peace pole and the words “May Peace Prevail On Earth” in the world’s major languages. Over the 10 years since then much effort has been made to educate people in promoting peace, an activity backed by UNESCO. This was indeed an eye-opener to me and worthy of more research. So apt that Taiping Peace Initiative was launched at this special town (city now?) as the name itself means “Great Peace” … and in the beautiful Lake Gardens too! Wonderful memories generated here. Thank You all who are promoting this Peace Initiative.